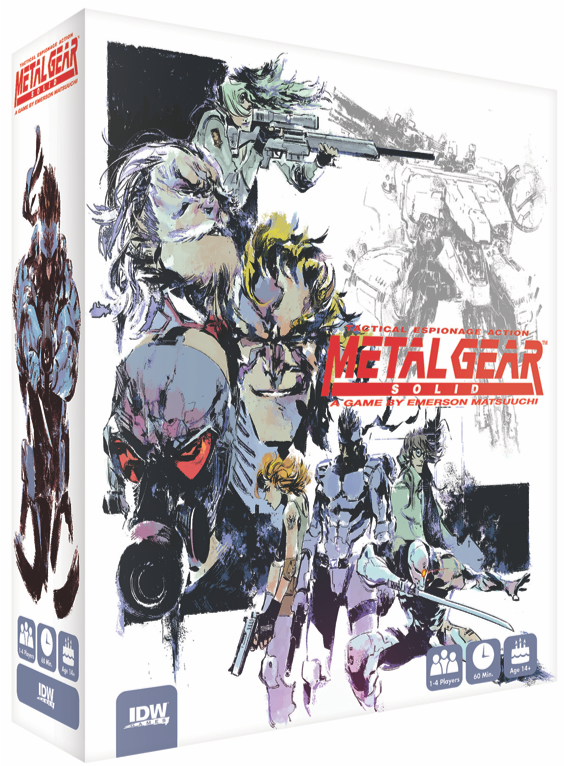 San Diego, CA (December 11th, 2018) IDW Games and Konami Digital Entertainment, Inc. announced today that they have partnered to bring Metal Gear Solid to the tabletop with Metal Gear Solid: The Board Game. Designed by Emerson Matsuuchi (designer of the Century game series, Reef, and Specter Ops) Metal Gear Solid: The Board Game is a fully cooperative, miniatures board game. Following the story of the first Metal Gear Solid video game, players take on the roles of Solid Snake, Meryl Silverburgh, Dr. Hal “Otacon” Emmerich, and Gray Fox the Cyborg Ninja. They’ll need to use their unique skill sets to avoid detection as they complete objectives across multiple campaign scenarios. Featuring a highly dynamic A.I. system and sandbox gameplay, missions can be completed in multiple ways and will always play out differently. Metal Gear Solid: The Board Game will feature miniatures by the highly regarded sculptor Francesco Orrù, and art from lifelong Metal Gear Solid fan and comic artist Kenneth Loh. Gaming media interested in playing Metal Gear Solid: The Board Game will get their first chance at E3 2019. IDW Games will be booking play session for media outlets for Saturday, June 8, through Monday, June 10. Gamers eager to sample Metal Gear Solid: The Board Game will have a chance to demo it at any of the following 2019 summer conventions: Origins Game Fair, Dice Tower Con, San Diego Comic Con, and Gen Con.